There is particular concern about campers lighting fires as there is a risk of fires spreading across the dry landscape. THERE HAS BEEN a significant increase in litter and dumping in the Dublin and Wicklow uplands this summer compared to this time last year. Volunteers for the Pure Mile project, which is a partnership between a number of councils and other bodies, has more than 1,000 volunteers who work to combat illegal dumping in the uplands. They have noticed a particular increase this summer in rubbish left by day visitors and people camping overnight in the good weather. 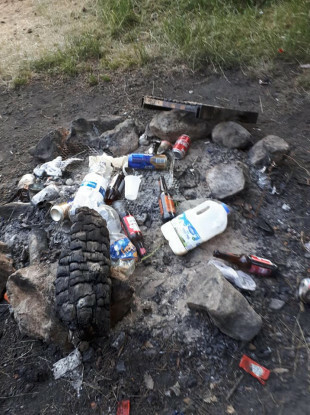 The Glenmalure group in Wicklow on a recent clean-up removed a number of abandoned tents, bottles, cans, barbecues, meat wrappers, nappies, even a child’s potty. “We’re getting people going out camping and visiting these areas who wouldn’t normally do it,” Pure project manager Ian Davis told TheJournal.ie. I was out at a site the other day and there were lots of people sitting out with barbecues and kids swimming in the river and the amount of rubbish left behind by families – they leave everything behind them, it is just baffling. You have this beautiful river bank and native woodland and all this rubbish thrown there. We’ve also had some bigger camp sites in Glenmalure, completely and utterly abandoned sites. The tents are fully erect, there are chairs, empty cans, burger buns – it’s like the people just disappeared overnight, they just got in their cars and left. He said the vast majority of people respect the valley, but “a minority are spoiling it for everyone”. In total, over 2,000 bags of illegal dumping litter has been removed by Pure Mile groups so far this year. Davis said another concern this summer is the number of people who are lighting fires in these areas as there is a risk they will spread across the dry landscape. Due to the recent warm weather, there is a red fire warning in place, which means that none should be lit. He said there is evidence at some of the abandoned camp sites that people have been ignoring this warning. “It is just totally irresponsible, there is no green grass, the leaves are falling off the trees and everything is so crisp. I understand some people might not be used to being out camping but it is ridiculous for them to light the fire and not think it may have negative consequences. The reality here is that if this landscape is burned up, there is no tourism, that’s the end of it. Email “'A minority spoiling it for everyone': Increase in rubbish left in Dublin and Wicklow mountains during hot spell”. Feedback on “'A minority spoiling it for everyone': Increase in rubbish left in Dublin and Wicklow mountains during hot spell”.